The Westwood Annex neighborhood is full of signs opposing changes suggested in the comprehensive plan draft. An overflow crowd spilled out of the Westwood City Council chambers Monday night and more than two dozen speakers expressed opposition to parts of the city’s proposed comprehensive plan that was before the planning commission for a public hearing. The comments largely concentrated on references in the plan to the area east of Rainbow along 47th Terrace and 48th Street. The objections, many from residents of those streets, were to suggestions that higher density housing should be considered. That area is often referred to as the Westwood Annex It was annexed into the city in 1960. The streets lie just to the south of the new Woodside Village development and the neighborhood runs east to State Line Road. The neighborhood has small lots and a narrow street right-of-way. Speakers were overwhelmingly opposed to changing the single-family character of the neighborhood, and to the purchase of any property assemble lots for redevelopment. They also opposed a suggestion that the two streets be converted to one-way. Cathy Davis, who lives on 48th Street, said the neighborhood was an “opportunity area” with single-family homes being redeveloped. 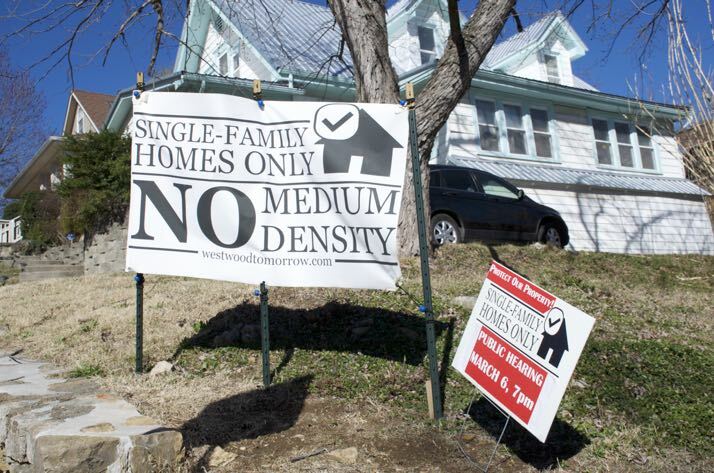 More than one resident said the area already was being revitalized with new single-family houses. “This plan has missed the spirit of this community,” said Dave Owens. “Our commercial areas are going to be where we are going to see the most pressure,” Ross added, saying he had hoped for more feedback about some of the areas such as the church and Entercom properties. The planning commission is planning a working session for April to make more changes to the plan.